Sadly many un-informed Muslims may be fooled by this, because they do not have sufficient knowledge about Ahlul-Sunnah or the Shia in general. 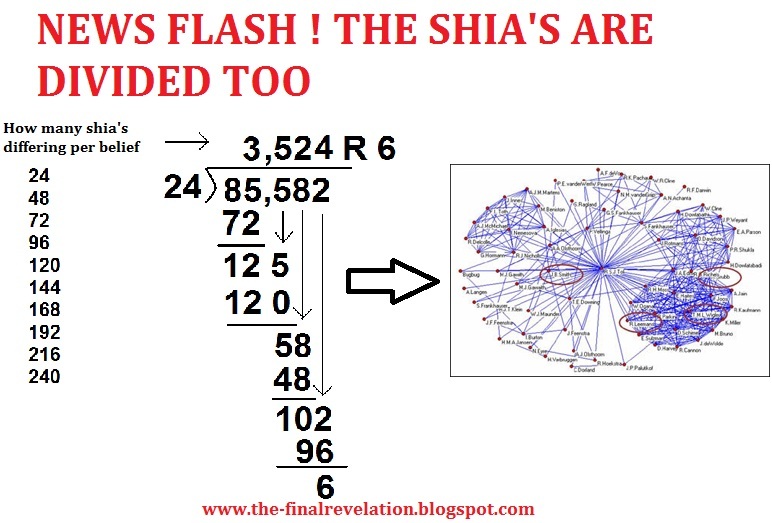 A Muslim with basic knowledge knows that this is untrue, the groups mentioned above are not sects, they are schools of jurisprudence and methodologies, all of them a part of Ahlul-Sunnah, also the Shia themselves were divided to more than a hundred different sects since their earliest days such as the Kaysaniyah, the Waqifiyah, the Nawousiyah, the Zaydiyah ect… one only needs to refer to their book “Firaq al-Shia” by al-Nawbakhti to read more about it. Today the majority of Shia are of the Ja`fari sect, which they claim is a “Madhab”, so we will go one step further to prove that the Ja`fari Madhab itself is extremely divided, setting aside all the other Shia sects. Many people assume that the Shee’ahs are united in their beliefs. This is incorrect. The Shee’ah have split into many different sects, each sect as misguided as the other. - Isma’eelis: In the early days of Shee’ism, the belief of imaamate was that the Imaamate goes from father to the eldest son, and no other line of succession is possible. But when Imaam Ja’far As-Saadiq’s eldest son Isma’eel died in his father’s lifetime, his younger son Musa was designated by his father as the next Imaam. In this case the Imaamate moved from Isma’eel to Musa and the normal procession from father to eldest son was broken. Some Shee’ahs objected to this solution and a new sect developed within the group. This is the origin of the Isma’eeli sect which holds that the belief that Isma’eel Ibn Ja’far was the last rightful Imaam. Ja’far As-Saadiq being the husband of Faatimah, who was the daughter of Hasan Ibn ‘Ali Ibn Husain Ibn ‘Ali Ibn Abee Taalib. - The Twelvers. This sect appear to judge the Isma’eeli and Nusayriyyah sect as disbelievers. This sect believes that the 12 Imaams have all come and gone, except for the 12th “hidden” Imaam (the one they believe to the the Mahdi). They claim that the 12th Imaam is hidden in a cave somewhere and will soon come out. The 11th Imaam being Al-Hasan Al-‘Askari. Strangely, Ja’far, the brother of this Al-Hasan Al-‘Askari said that he had no child. Fearing that the foundations of the Shee’ah sect will fall asunder, a Shee’ah scholar named ‘Uthmaan Ibn Sa’d claimed that the Imaam actually had a son who went into hiding at the age of 4 and that he (‘Uthmaan) was his deputy. Since then, over 1000 years ago, this hidden Imaam is still in a cave and the Shee’ahs are awaiting for the time he comes out of hiding! - The Zaidiyyah. Many Shee’ah sects consider this sect to be infidels. - The Jaroodiyah. This are an offshoot of the Zaidiyyah sect and are the only ones that are considered Rawaafidh from that branch. - The Ja’fari. They call upon ‘Ai Ibn Abee Taalib, Hasan and Husain, and according to the permanent committee of Saudi Arabia (comprising of Sh. ‘Abdul-Razzaaq Al-Afifi, Sh. ‘Abdullaah Ibn Ghudayaan & Sh. ‘Abdulaah Ibn Qa’ood) this sect are polytheists who have apostatized from Islaam. - The Shaykiyyah. The former of this sect is the Shee’ah scholar Ahmad Al-Ahsaa’i. - The Kashifiyyah. The former of this sect was the disciple of Ahmad Al-Ahsaa’i^, a Shee’ah scholar by the name of Kazim Ar-Rushti. - The Karimkhniyyah. The former of this sect was the disciple of Kazim Ar-Rushti^, a Shee’ah scholar by the name of Muhammad Karim Khan. - The Qartiyyah. The former of this set was a female scholar named Qurrat Al-Ayn, and was a disciple of the Shee’ah scholar Muhammad Karim Khan^. - The Baha’iyyah. The former of this sect was a Shee’ah scholar by the name of Mirza Husain ‘Ali. - The Khattabiyyah. Like the Isma’eeli sect, this sect also believes that after Ja’far As-Saadi, his son Isma’eel should have been the next Imaam. - The Futaihiyyah. The followers of ‘Abdullaah “Al-Aftah” Ibn Ja’far As-Saadiq, and reject the other “Imaams” who came after him. - The Waqifiyyah. This sect stopped their Imaams at Musa, the son of Ja’far and do not accept the Imamate of all the Imaams after him. - The Nawusiyyah. This sect are the followers of a man called Nawus or Ibn Nawus, who believed that Ja’far As-Saadiq did not die and that he is the Mahdi. One finds that almost each and every Mujtahid and marji’ has his own madhhab in some sort of way, despite the fact that about 30 scholars claimed that they are in contact with the hidden 12th Imaam (who is believed to be hidden in a cave). Their leader al-Tusi is saying that the Twelver Shia disagree on the majority of the five thousand narrations, each group of scholars follows different narrations and has different interpretations, this is mainly because of the huge amount of fabricated Shia narrations and the contradictions and the so called Taqiyyah of their Imams. al-Tusi goes as far as to say that the difference among the Ja`fari scholars in Fiqh is more than that of Abu Hanifa, Malik and Shafi`i put together!! The reality of the Ja`fari sect, is that it isn’t the word of the infallible, it is simply the word of the scholars, their Ijtihad and their opinions. Each grand Shia Mufti today, or as they like to call him “Marji`” has his own Madhab and Ijtihad, such as Rouhani or Sistani or Shirzai ect… each has different rulings and they are many, it is even considered prohibited for a Shia who follows a certain Marji` to go and take religious rulings from another Marji`. How then can they claim unity and accuse Ahlul-Sunnah of being divided because of the four Madhabs? If these Shia were truely following the infallible then they wouldn’t differ in their rulings and opinions nor would it be Haram for a Shia to follow more than one Marji` at the same time. قول بالجواز متعة لا دواماً، وبملك اليمين. قول بالجواز في حالة الإضطرار وعدم وجود المسلمة . قول بالجواز مطلقاً على كراهية . قول بالجواز مطلقاً بدون كراهية . 2-Permissible in temporary Mut`ah marriage. 3- Ownership of what the right hand possesses. 4-Permissible in case of need when there are no Muslim women. 4- الوجوب بشرط أن يكون الأمام فقيهاً . 5- التوقف بين الحكم بالوجوب والحكم بالحرمة . 2-Wajib Takhyiri (One is given the choice between attending Zuhr or attending the Friday). 3-Wajib `Ayni (Absolutely obligatory on all). 4-Obligatory only if the Imam is a jurist. First saying: The Imam and his representative are not a condition according to the Muhadditheen al-Kulayni and al-Saduq. Second saying: In the case of the Wajib `Ayni their presence is a condition, but if not then it becomes Wajib Takhyiri. This is the apparent position of al-Tusi in al-Nihayah. Third saying: Presence of the Imam and his representative is a condition, without the occultation of the Imam, according to al-Shaheed al-Thani in his books and al-`Allamah in al-Nihayah. Fourth saying: Presence of the Imam and his representative is a condition if possible, and if both are unavailable for some reason then it is sufficient for one who has the required qualities to lead the prayer. This is the saying of abu al-Salah al-Halabi. Then the author goes on to state some other differences but the above is sufficient for our readers. After all of this, you will still find some of their scholars who have the audacity to say that we must join the ranks of the Twelver Shia so that we may find salvation and not differ!! al-`Allamah al-Hilli one of the Shia top classical scholars wrote about the differences of the Shia up until his time, which is the eight century, and the result was a huge ten volume book called “Mukhtalaf al-Shi`ah”, and if the reader were to browse through those books he would realize that al-Tusi was right when he said that the Ja`fari scholars differed on every single matter in Fiqh. So what is this unity and “divine guidance” that the Ja`fari Twelver Shia keep boasting about!? When their opponents are doing far better than they are!